Erin Akins, Work Green program co-ordinator in the Office of Sustainability. As Energy Conservation Month comes to a close, offices from all over campus continue to work together in an effort to combat waste and help the U of S become more sustainable. The Work Green program, launched by the Office of Sustainability in 2014, is a network of workplaces across campus committed to improving sustainability practices. "I'm really looking to support other offices in their sustainability initiatives," said Erin Akins, the Work Green program co-ordinator. "In doing so, I always like to highlight their work." In just over a year, the program has grown exponentially to include more than 40 staff members in units and departments across campus, including Facilities Management, Financial Services, the President's Office and even the Prince Albert distance education campus. Each office is led by a "champion" to encourage colleagues to adopt and maintain more sustainable habits. In turn, their workplace is recognized based on many factors, such as waste reduction, water and energy conservation, and sustainable purchasing practices. The Office of Sustainability provides resources to program participants, including educational opportunities (such as workshops and training sessions) as well as communications materials. Grants of up to $300 are also available to help Work Green units invest in the adoption of greener practices. "If it seems appropriate and it supports sustainability, then we support it," said Akins. "The grants aren't too large but they go a long way." Indeed they do. In 2015, for example, the University Library put its grant toward a paper reduction campaign, which included educational materials targeted at students to reduce their printing. Through their efforts, they used approximately 1.5 million fewer sheets of copy paper than in 2014. Other grant projects with positive results include an electric composter to recycle coffee grounds and food waste, reusable coffee pods (an issue many offices are struggling with, explained Akins) and purchasing reusable dishware and utensils to eliminate single-use items such as water bottles and paper cups. "Every department on campus is different," said Akins. "Some have funding in their offices to buy these things. For others, it would be people buying that on their own. This is an opportunity for those offices to do that, and it doesn't have to come out of someone's pocket." Quarterly meetings are also held for the champions to discuss and share their green workplace initiatives and successes—a highlight for Akins. 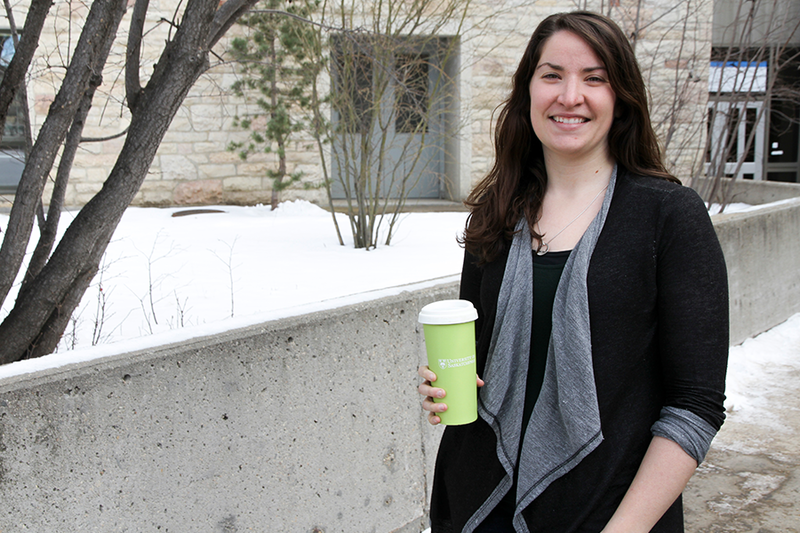 "My favourite part about the program is seeing those discussions between offices on campus," she said. "It's those discussions and connectivity that are bringing big change." Pack a waste-free lunch. Opt for reusable containers over disposable materials like plastic wrap and aluminum foil. "You can generate a lot of waste just with your lunch," said Akins. BYOM (bring your own mug). If the line-ups are any indication, the U of S is a coffee-friendly campus. But the single-use cups make for a lot of excess trash. The Tim Hortons and Starbucks outlets on campus offer discounts for anyone who lugs their own mug. If you do not have a reusable mug, "everyone who signs up for the program gets a free green mug," she said. Pay attention to what you are printing. "This is a huge one," said Akins. Ensure printers are set to double-sided printing and think about what you need to print, say, for a meeting. "It takes a bit of forethought in terms of how you're sharing materials." Quality > quantity. Many offices purchase promotional items to give away as gifts, only to have them end up in the trash soon after. "Really look at what you're purchasing as an office," said Akins. "Is it a high-quality item? Do people really need it? Is there something you can give that they'll actually use?" If not, consider alternatives.